The PISA OECD 2012 results was released yesterday. Shanghai, China still maintains as the top performing education system against 65 countries in Reading, Mathematics and Science. Singapore and Hong Kong ranked at second and third position respectively based on the recent results of PISA 2012 examination. Finland was known for the best education system in Europe region. Finland used to be one of the top 10 educational performers in PISA rankings previously but it dropped at 12th position in Reading, Mathematics and Science based on PISA 2012 results which was rather shocking to Finnish educators. In the meantime, the American students are still lagging behind in global education ranking based on PISA 2012 results. U.S. Education Secretary Arne Duncan characterized the flat scores as a "picture of educational stagnation." One of the main factors leads to socio-economic background and lack of motivation drive among students to excel in education. The latest Programme for International Assessment (Pisa) results are out today. The release by the Organisation for Economic Co-operation and Development (OECD) shows that the UK has seen slight improvements in maths and reading performance but has slipped down four places in the overall ranking for science. The UK is ranked 23rd for reading, 26th for maths and 20th for science. In 2009 it was placed 25th, 28th and 16th respectively. Shanghai tops the overall ranking with Singapore and Hong Kong being placed second and third place respectively. Since 2000, the OECD has attempted to evaluate the knowledge and skills of 15-year olds across the world through its Pisa test. More than 510,000 students in 65 economies took part in the latest test, which covered maths, reading and science, with the main focus on maths - which the OECD state is a "strong predictor of participation in post-secondary education and future success." Who's top of the class? Qatar had the highest reading score-point difference associated with one calendar year although the OECD warn that when looking at annualised change that "the average change experienced over successive PISA assessments doesn't capture the extent to which this change is steady, or whether it is decelerating or accelerating". Of 64 countries with comparable data, 19 reported an average annual improvement in science performance, 37 showed no change and eight recorded a decline. Kazakhstan, Turkey and Qatar all reported annualised change of more than five points in science performance. Boys scored higher than girls in maths in 37 out of the 65 countries and economies, while girls outperformed boys in just five countries; Jordan, Qatar, Thailand, Malaysia and Iceland. The OECD claim though that the gender gap is relatively small - in only six countries is it greater than the equivalent of half a year of schooling. According to the OECD, girls "feel less motivated to learn maths and have less confidence in their abilities than boys". The OECD also found that between 2000 and 2012, the gender gap in reading performance - favouring girls - widened in 11 countries. The Pisa results show that when it comes to science, boys and girls perform similarly. But in Colombia, Japan and Spain a gender gap in favour of boys was observed in 2012 despite no significant difference existing in 2006. The report also looks at how the wealth of a country affected the success of its students in mathematical tests. There is a correlation between a higher GDP per capita and a successful performance. The relationship suggests that 21% of the variation in countries' mean scores can be predicted on the basis of their per capita GDP (12% of the variation in OECD countries). Countries with higher national incomes are thus at a relative advantage, even if the chart provides no indications about the causal nature of this relationship. This should be taken into account particularly when interpreting the performance of countries with comparatively low levels of national income, such as Viet Nam and Indonesia (Mexico and Turkey among OECD countries). The scatter graph below shows how nations GDP per capita correlates with their performance in mathematical tests. Although it is worth noting there are some excetions to this rule. For example, Qatar, which had a relatively low mean mathematics score of 376 despite its way above average $77,000 GDP per capita. Similarly, spending on education has an even stronger match with performance in mathematical tests. It accounts for 30% of the variation in performance between countries and 17% of the variation within OECD countries. However, South Korea, which has the best mean performance of any country in the tests spends well below the average on education, one of several anomalies showing the pattern is not universally applicable. The table below shows the mean scores across the three subjects tested in the Pisa assessments. The table has been colour coded to show how the scores compare against the OECD average. Green shows a score above the OECD average, blue signifies in line with the OECD average and red illustrates a score below the OECD average. Pisa results for 2009 and 2012 can be found in our downloadable spreadsheet. Schoolchildren in the UK are still far behind their peers in other countries despite the money pumped into the education system by successive Governments. The results of international tests published today reveal that Britain's performance has not improved over the past three years, with countries such as Japan and Singapore leading the global league tables. The tests, part of the Programme for International Student Assessment (PISA), measure the achievement of 15-year-olds in maths, science and reading. The latest results show that girls are far behind boys in maths lessons, with female pupils less likely to enjoy studying the subject. And figures from Wales are particularly worrying, as its students performed worse on every measure than those in other parts of the UK. Wales is falling behind the rest of the UK in reading, maths and science, the new league tables show. The nation's teenagers scored lower results on average in each of the three subjects than their counterparts in England, Northern Ireland and Scotland. The figures show that 15-year-olds in Wales scored 468 points on average, compared with 498 in Scotland, 495 in England and 487 in Northern Ireland. In reading, Scotland scored 506 points on average, England scored 500, Northern Ireland 498 and Wales 480. In science, England's average points score was 516, compared with 513 in Scotland, 507 in Northern Ireland and 491 in Wales. The OECD report concluded that for each of the three subjects, 'performance in Wales was lower than the rest of the United Kingdom'. The results come despite the billions of pounds invested in education by Labour, and the decision by the Coalition to 'ring-fence' Britain's schools budgets while making deep cuts in other public services. 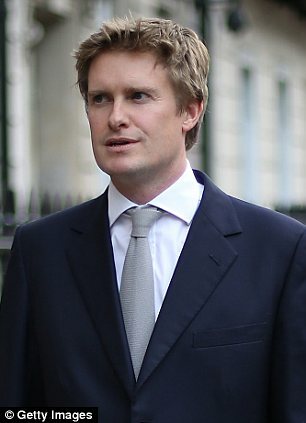 Education Secretary Michael Gove blamed the disappointing figures on the previous Government, but his Labour opposite number Tristram Hunt said it showed the importance of improving the standards of teachers. The UK is in 26th place for maths, 23rd for reading and 21st for science in the PISA league tables for 2012, which focus on applied skills rather than theoretical knowledge. 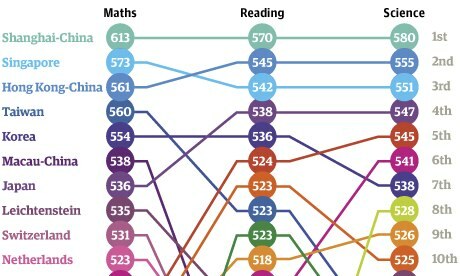 The findings show that the UK's average score for maths was 494 and in reading it was 499, roughly average for all countries and on a par with the Czech Republic, France and Norway. Britain did better in science with an above-average 514 points, similar to Australia, Ireland and Slovenia. However, on every measure the country lags behind leading nations including Singapore, Hong Kong, South Korea, Japan and Shanghai in China. The OECD, which conducts the tests, said that Britain's performance was strikingly similar in 2006 and 2009, the last two times the league table was published. 'In essence you can say that the UK stands where it stood in 2009,' said Andreas Schleicher, special adviser to the OECD's secretary-general. Business groups were sharply critical of the results, arguing that there is an urgent need to raise the standards in British schools. Mike Harris, head of education and skills at the Institute of Directors, said: 'The generation of young people tested for the latest OECD PISA report will be looking for jobs in a competitive and unforgiving global race. 'Unfortunately, thanks to historic complacency, the UK appears to have its feet shackled at the starting line. 'We know from previous OECD skills surveys that, despite billions of pounds of investment in education over the last 15 years, school leavers in the UK are among the least literate and numerate in the developed world. Girls in the UK perform worse than boys in maths and are less likely to enjoy the subject, according to the results of the PISA tests. British boys scored an average of 12 points more than girls, a greater gender gap than that seen in most countries. The findings also show that girls find the subject less enjoyable and are more anxious about studying it. Overall, 59 per cent of boys said that they are interested in learning maths, compared to 53 per cent of girls. The study adds that across all OECD countries, greater anxiety about maths is linked to lower scores in the subject. In the UK, the proportion of students who had high levels of maths anxiety was lower than the OECD average, but girls were more anxious than boys, it says. Boys also did better than girls in science with a gender gap of 13 points, larger than the OECD average of one point. But girls performed better in reading, scoring 25 points more on average, significantly less than the OECD's average gender gap of 38 points. Katja Hall, CBI chief policy director, said: 'High-performing schools are the best way to support economic growth and greater opportunity. These figures should be a wake-up call. 'UK schools are treading water when we know that matching the very best could boost the growth rate by one percentage point every year. 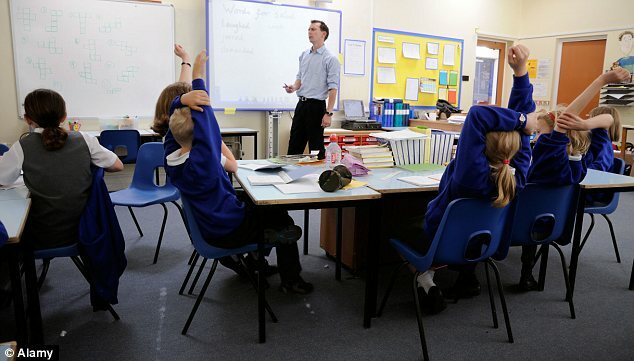 Britain's poor performance comes despite its above-average spending on education. The UK spends an average of £59,889 per student, compared to an OECD average of £50,951. The report shows that around one in eight (12 per cent) of UK teenagers are considered 'top performers' in maths, nine per cent in reading and 11 per cent in science. By contrast, more than a fifth are 'low performers' in maths, meaning they can only solve the simplest problems. 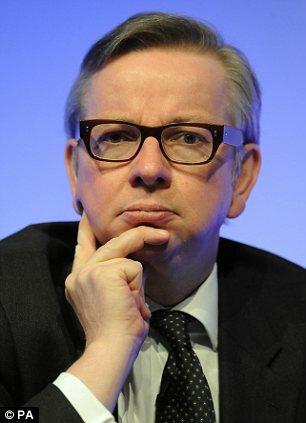 Mr Gove said: 'These poor results show the last Government failed to secure the improvements in school standards our young people desperately need. He added that the performance 'underlines the urgent need for our reforms'. However, Mr Hunt told BBC Radio 4's Today programme that only a crackdown on unqualified teachers could boost pupils' performance. 'What we have under this government is a series of policies which lead to the deprofessionalisation of teaching,' the Shadow Education Secretary said.